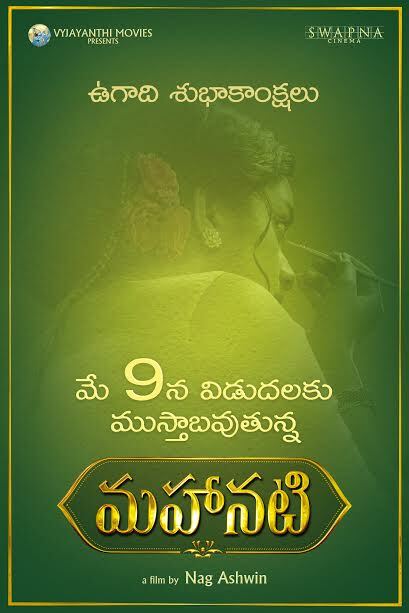 Tollywood's craziest project of the year Mahanati, biopic on legendary actress Savitri produced jointly by prodigious production houses Vyjayanthi Movies and Swapna Cinema, directed by Nag Ashwin is hereby officially announced to arrive in theatres on May 9. Coincidentally, the day happens to be the release date of all time industry blockbuster Jagadekaveerudu Athilokasundari produced by Vyjayanthi Movies in 1990. Currently, the team if Mahanati moved into final production phase canning few important scenes. Eversince, Keerthy Suresh along with Samantha, Dulquer Salman, Vijay Devarakonda, Mohan Babu, Prakash Raj, Shalini Pandey, Malavika Nair, Bhanu Priya, Divya Vani, Srinivas Avasarala, directors Krish, Tharun Bhascker and other popular names including that of Naga Chaitanya playing the iconic ANR role are made part of this project, there was an immediate hike in expectations. However, Nag Ashwin and his technical team recreated the forgotten glorious black and white era to make Mahanati a true celebration on the life of Savitri.